Friction stir processing (FSP) was applied to plates of cast aluminum A206 alloy. The focus of the work was on the evolution of microstructure during processing, which yielded dramatic decrease in the local grain size of the processed material. Reduction in pore morphology features, as well as intermetallic particle size, was also observed. Friction-stir-processed metal is characterized by a high ratio of high-angle grain boundaries to low-angle boundaries compared to what is observed in the as-cast alloy. 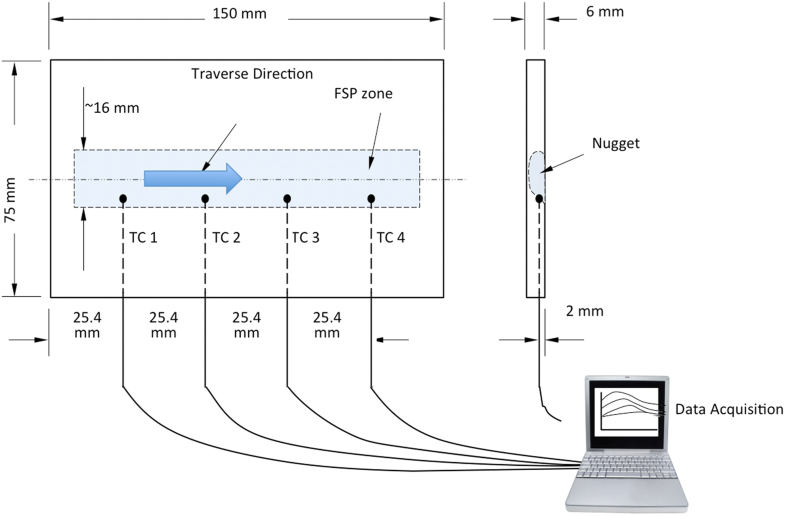 Consistent with findings of other investigators, FSP generates a product nugget which has a portion of its structure having an onion skin-type structure that is characterized by a preferred crystallographic texture within individual bands in the nugget. Schematic diagram of FSP setup and the rotating tool. FSP has emerged as an important processing technique for refining the grains of metallic components demonstrating the capability to generate ultra-fine grains down to sizes below 200 nm.13, 14, 15 Abundant studies have been carried out on wrought Al alloys such as 2XXX and 7XXX series alloys, which are widely applied in the aerospace industry,16, 17, 18 however, not much work has been done with cast Al alloys. This study was performed on alloy A206, which is a commonly used cast aluminum alloy with high-strength and widespread applications. 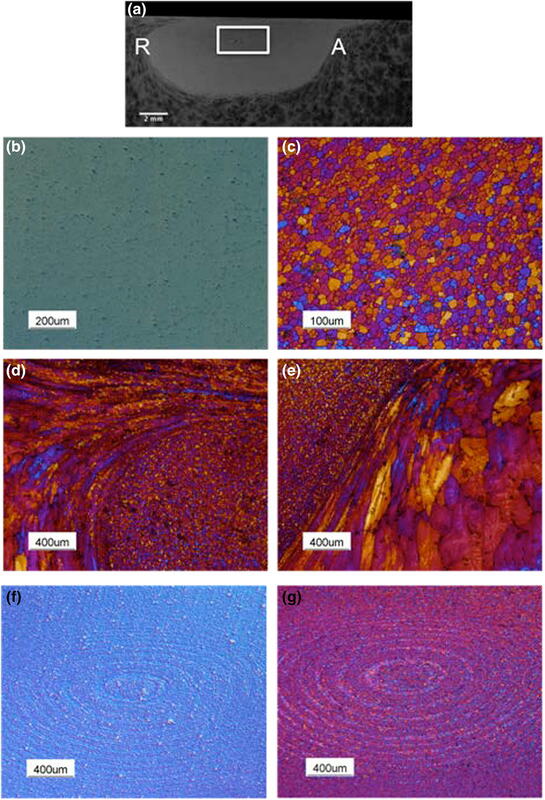 The microstructure of the A206 alloy via FSP was locally manipulated to refine the grain structure and to eliminate heterogeneities such as large porosity as well as coarse intermetallic phases within the castings. Detailed microstructural analyses were carried out to study the effects of FSP on the resultant microstructures, and to establish the operating mechanism. The apparatus for FSP consists of the main FSP platform (machine table), the fixture, and instruments (thermocouple and dynamometer) used to detect and record the temperature distribution during processing. For the current study, the main platform for FSP is a HAAS CNC machine to which a specifically designed tool has been attached. The diameter of the tool shoulder is 16 mm, and at the end of the shoulder there is a tapered probe of length 3.2 mm. A tilt angle of 3° (angle between machine spindle and workpiece normal) has been applied to induce forging action at the trailing edge of the shoulder. This is achieved by inserting a back plate whose surface is machined into a slant surface. Proper tool penetration depth is very important in generating enough friction heat between the tool and the work piece to produce a good FSP finish on the workpiece. The minimum tool penetration depth requires the shoulder of the tool to have enough contact with the work piece, and this number is calculated based on the specific contact condition between the tool and the material. A commercially sand-cast A206 plate supplied by Eck Industries of Manitowoc, WI, was used as the workpiece. The alloy composition was Al–4.33Cu–0.077Si–0.046Fe–0.256 Mg–0.343Mn. Dimensions of the work piece were 15 (L) × 7.5 (W) × 0.6 (T) cm. Processing parameters used were: tool rotation speed—1000 RPM; tool traverse speed—50.8 mm/min; and tool penetration depth—4 mm. The length of the FSP region was 12.7 cm. The local temperature of the work piece was monitored with K-type thermocouples, and the data were recorded via FLIR S40 system. Four equi-distant holes were drilled along the FSP traverse direction to accommodate thermocouples, and the distance between each thermocouple was 2.54 cm. These thermocouples were inserted into the work piece at 2 mm below the top surface. Care was taken to assure the tips of the thermocouples would not be within the FSP work zone. Figure 2 shows a schematic of the workpiece and the location of the thermocouples. Schematic diagram showing workpiece with inserted thermocouples. Samples for metallographic analysis were sectioned perpendicular to the FSP traverse direction and prepared for microstructural analysis. Barker’s etchant and polarized light were used to reveal grain morphology. Specimen preparation for the electron backscattering diffraction (EBSD) analysis was carefully performed in order to properly image the structure and obtain high-quality diffraction patterns. A Carl Zeiss SUPRA-55 SEM equipped with the EBSD detector was used for local grain orientation data acquisition. The step size chosen for the FSPed specimen was 0.5 μm, and for the as-cast specimen was 5 μm. Thin films for transmission electron microscopy (TEM) analysis were prepared via focus ion beam (FIB) technique at selected locations in the processed region. TEM work was carried out with a JOEL 2000 microscope operated at 200 kV. Figure 3 shows thermal profiles measured at four locations on the workpiece during FSP illustrating temperature change as a function of time. The area under each of the curves is consistent, which signifies that the thermal history in the processing direction was quite steady.19 The 0 point on the time axis denotes the time when the tool began to contact the work piece, and the penetration process lasted about 20 s. The temperature began to rise once the tool penetrated into the work piece, and the peak value was observed when the tool moved directly above the thermocouple. The peak values measured were 338 °C, 363 °C, 405 °C and 422 °C, respectively. One should note that since the thermocouples did not reach the tip of the tool during FSP, the actual local maximum temperature of the material is estimated to be higher than the measured values by about 30 °C. The different thermocouple locations experience different cooling rates from their peak temperatures. This follows from the influence of the moving heat source on the overall temperature profiles in the workpiece. After the tool passes TC1 and the workpiece is progressively heated along the rest of the FSP zone, the flow of heat from the TC1 location is restricted as it sees the influence of the heat being generated along the rest of the zone. Each of the thermocouples will experience somewhat different cooling because of the linear path of the heat source. Localized thermal profiles at four different locations within the work piece. Figure 4 shows optical micrographs of the as-cast sample. The microstructure of the as-cast A206 contained some intermetallic phases that were mainly coarse needle-like CuAl2 compounds (Figure 4a). The average grain size is about 400 μm, and the dendritic microstructure is evident in Figure 4b. Significant porosity was observed; pores were up to 200–300 µm in length. 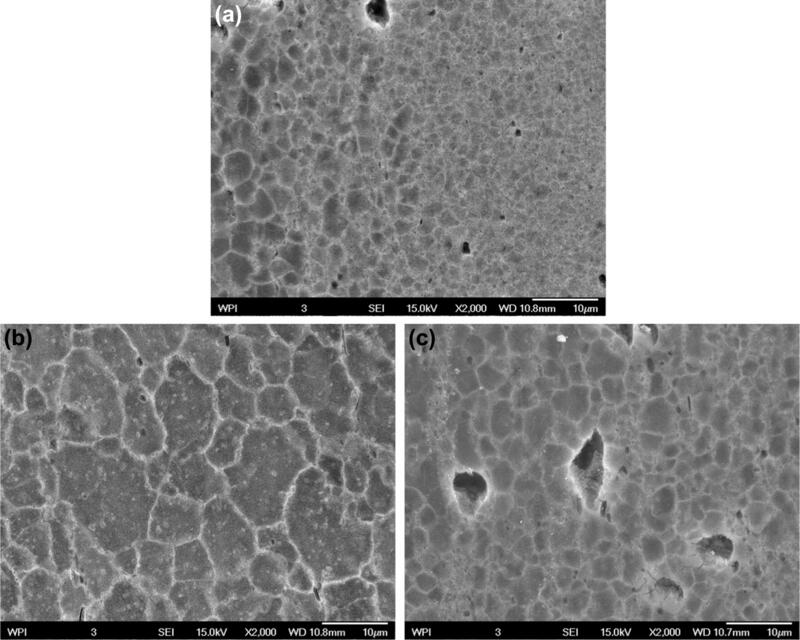 Micrographs showing (a) second-phase distribution in the as-cast A206; (b) grain morphology of as-cast A206. Macrographs and micrographs taken from the sample after FSP are shown in Figure 5. The FSP region has a basin-shaped nugget with a wide top; the left side of the FSP region is not symmetrical with the right side. In Figure 5a, “A” refers to the advancing side, on which the tool rotation direction is the same as the tool traverse direction; “R” refers to the retreating side of the work piece, where the tool rotation direction and tool traverse direction are opposite to each other. The boundaries are evidence of the asymmetric strain distribution experienced by the material during processing. By comparing Figure 5b with 4a, one can see the dramatic change in the second-phase particle distribution. The FSP has fragmented the second-phase particles and more uniformly distributed them within the process zone. Some of the fragmented soluble CuAl2 particles could have dissolved due to the elevated temperature experienced during FSP. It is notable that macroscopic porosity is essentially eliminated. This results from the compressive stresses imposed during the process at very high temperatures. There might be some very fine scale porosity remaining. 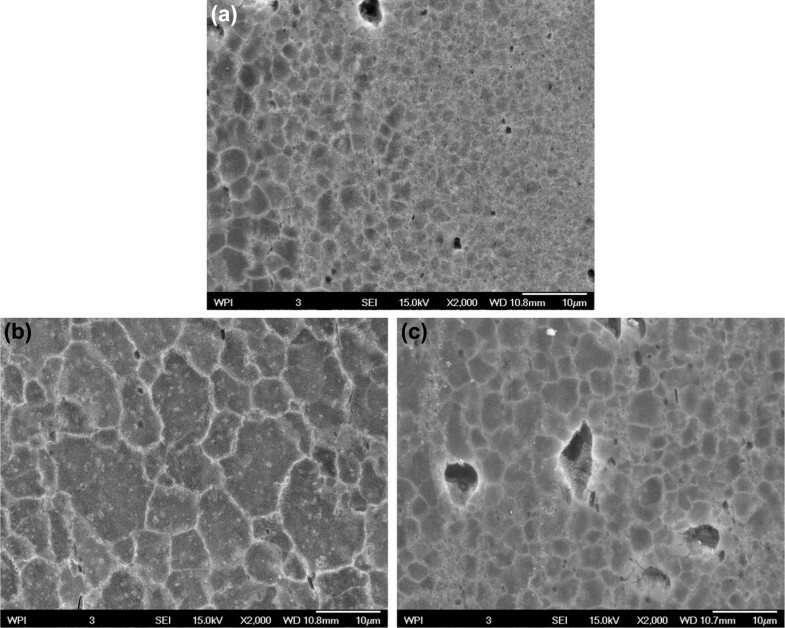 Macro- and microimages of FSP region (a) macrograph of FSP region; (b) second-phase distribution of FSP’d A206; (c) grain morphology of FSP’d A206; (d) micrograph of retreating side; (e) micrograph of advancing side; (f) micrograph of the onion ring; (g) grain orientations inside the onion ring region. Grain boundaries and grain size in the FSP zone are clearly depicted in Figure 5c. After FSP, grains are equiaxed and their size decreased to ~ 10 μm, a reduction of more than one order of magnitude compared with the original grain size. Figure 5d and e shows grain structures of the transition zones (retreating and advancing sides) between the FSP region and the matrix material. There is no distinct boundary between the FSP region and the dendritic structure in the unworked plate. Rather, there is a zone where the grains have been sheared to an ever increasing extent at locations close to the FSP nugget. In transition areas, grains are elongated and bent and seem to deform along the shape of the nugget. The FSP region contains a special microstructure feature, “the onion ring” structure, which is also called the banded structure.20, 21, 22 The onion ring structure is marked with a white rectangular shape in Figure 5a. From the transverse cross-sectional view (Figure 5f), we can see that the onion rings consist of concentric, elliptical rings located near the middle of the FSP nugget. It has been reported that the space between each ring corresponds to the advance per revolution of the tool.22 Previous studies reported that the appearance of onion rings was due to a periodic particle density variation or grain size variation.23 However, as shown in Figure 5f and g, one cannot observe variations of grain size or particle density in the onion ring region. 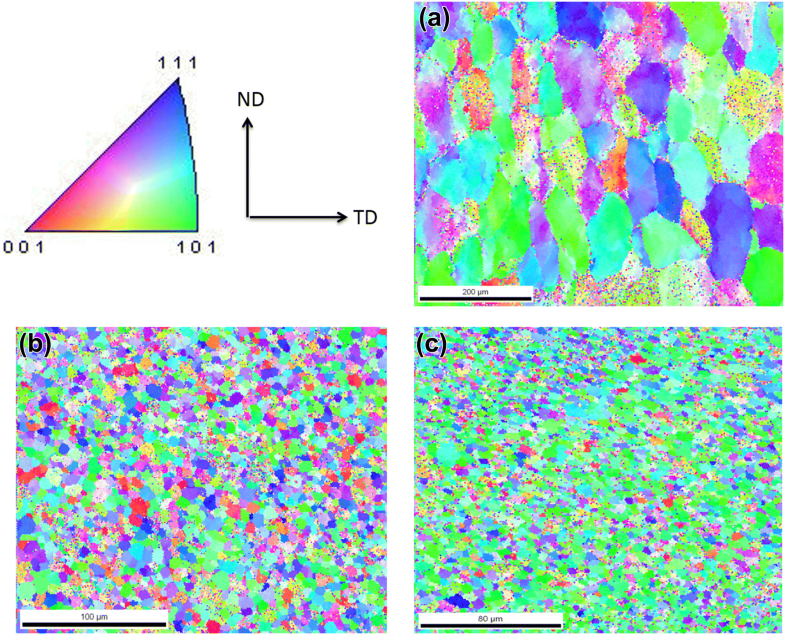 Polarized light was used to reveal grain morphologies; different colors indicate different grain orientations. As shown in Figure 5g, within each ring, there are many grains that show a similar orientation (shown in light blue color). This result is supported by a number of researchers,24, 25, 26, 27, 28 indicating that there exists a texture or grain orientation component to the onion ring structure. Grain size varies from the top to the bottom of the FSP nugget (Figure 6). The finest grains were observed in the top layer of the FSP region, where the shoulder directly contacted the work piece. The average grain size in this region was about 5 μm. Grains are coarser in the middle of the nugget where the average grain size was approximately 10 μm. Some finer grains were observed in the bottom region of the nugget, and the grain size in this region is comparable to that in the top layer. This significant grain size variation along the vertical direction of the FSP region is believed to be due to the variable strain rate and temperature from the top to the bottom of the nugget. Small porosity features are visible in Figure 6a and c. These pores are considerably smaller than the porosity features seen in Figure 4b. SEM micrographs showing grain size from the top to the bottom of the FSP nugget: (a) top layer; (b) middle region; (c) bottom layer. 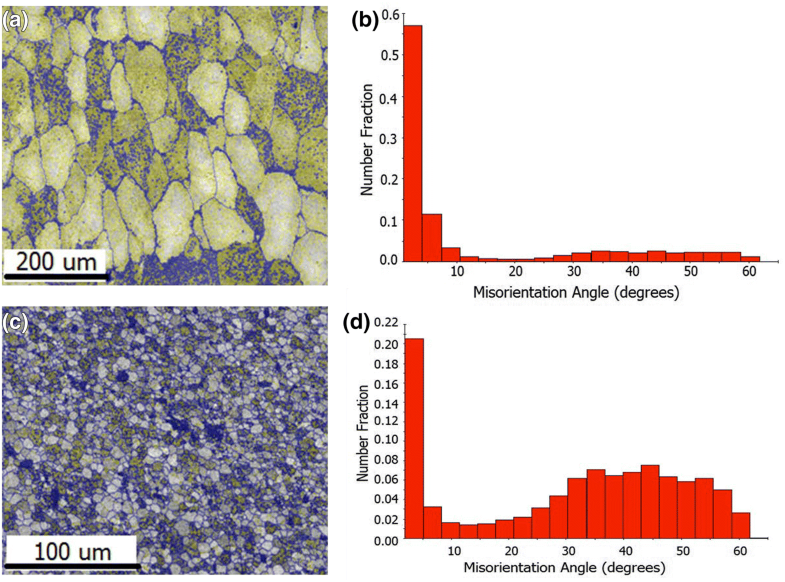 Grain boundary characteristics were analyzed via EBSD. Figure 7a and c is image quality (IQ) maps taken from the as-cast A206 and FSP A206 samples. The IQ map is overlaid with grain boundary character indicators. We defined “high-angle” boundaries as boundaries with misorientations exceeding 15°, whereas the “low-angle” boundaries are defined as boundaries with misorientations between 1° and 15°. High-angle grain boundaries (HAB) are marked in blue color. Boundaries with misorientations of less than 1° were not included in any analyses. Figure 7b and d is histograms showing the frequency distribution of grain boundary misorientation angles in the as-cast and FSP’d specimen. The fraction of high-angle grain boundaries increased markedly from 26.6% before FSP to 76.7% after FSP. Image quality maps overlaid with low-angle and high-angle boundaries and misorientation angle distribution histogram plots of the as-cast A206 in (a) and (b); and FSP’d A206 in (c) and (d). 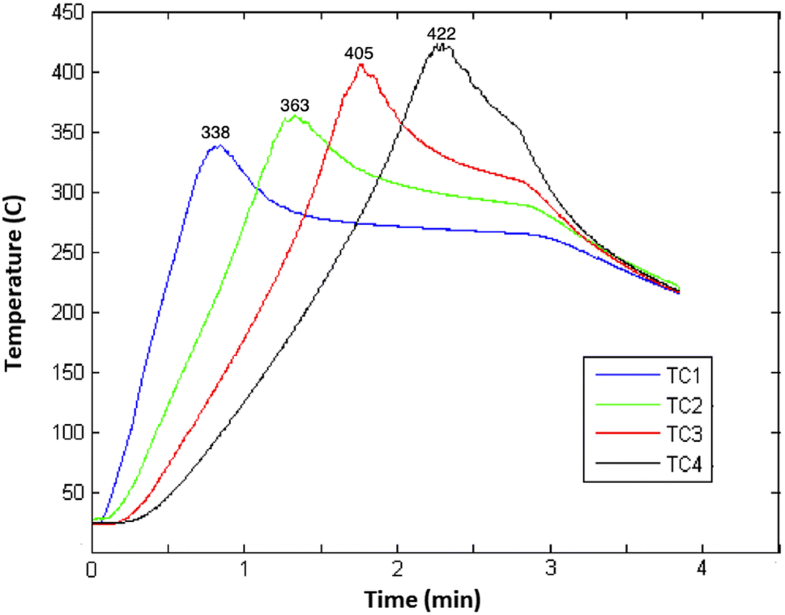 The substructure of the FSP material was examined via transmission microscopy—TEM. Figure 8 shows a well-formed high-angle boundary structure. The interior of the grains clearly had some residual dislocation substructure. There is no evidence of extensive internal subgrain boundaries or other intragranular recovery stabilized dislocation substructure which one might expect with a DDRX process. However, with a grain size in the range of 5–10 microns and with high processing temperatures experienced during FSP, the intragranular substructure might readily be absorbed into the high-angle boundaries through recovery. But we also note that the time at temperature is relatively short, so the extent of recovery may be limited. TEM micrographs showing the DRX microstructure: (a) clear grain boundaries of the recrystallized grains; (b) dislocation loops in the grain interior. It is difficult to be conclusive as to whether the recrystallization is continuous or discontinuous in nature. While the high processing temperature of FSP and high stacking fault energy of aluminum can favor recovery-type mechanisms, the extensive shear deformation imparted by the FSP process is expected to generate high misorientation gradients throughout the processed nugget to support the high-angle boundary formation required by the CDRX process. The misorientation distributions (shown in Figure 7b, d) indicate that although the number of high-angle boundaries increased after FSP, there is still a large frequency of low-angle boundaries which might support an argument for CDRX. But low-angle boundaries can also result from preferred crystallographic texture that develops as a result of the shear-type deformation imparted to the FSP nugget. The temperature and strain rate of the deformed material are two factors that affect dynamic recrystallization during FSP. Chang et al.30 have used the Zener–Hollomon parameter which combines these two factors into a temperature compensated strain rate to help explain the grain refinement of AZ31 Mg alloy during FSP. They developed a relationship which expresses the natural log of the grain size as being proportional to negative of the natural log of Z. The latter implies that grain size will decrease with increasing strain rate and that grain size will increase with increasing temperature. In brief, the recrystallized grain size will be influenced by the total amount of local strain imposed in the material and the thermal history through the stirring process and subsequent cooling stage. As reported in Figure 6, there was a gradient in grain size through the FSP nugget. The small grains were found at the top of the nugget. The metal at top of the nugget experiences the highest heat from friction at the shoulder of the tool, but it will also undergo the highest strain from the shoulder as that part of the tool continues to shape the nugget after the probe has passed through. The high level of strain experienced by the near surface is expected to be the dominant influence refining the grains. Near the bottom of the nugget, the grains are also quite small. The material at the bottom of the nugget undergoes a substantial amount of strain, though less strain than the rest of the nugget, and it is also be the coolest portion of the nugget. As a result, the time for recovery, recrystallization, and coarsening at the bottom of the nugget is curtailed. In the middle of the nugget, the strains are quite high and the structure will have additional time for thermally activated processes to occur, explaining the slightly larger grain size. Euler maps taken from the as-cast and FSP’d samples are shown in Figure 9. The reference direction is the crystal axis that is parallel to the FSP traverse direction. Different colors shown in maps represent various crystallographic directions as coded in the color scheme inverse pole figure. As shown in Figure 9a, the cast microstructure, though not completely random, seems to have only a mild texture. In some of the nuggets, for example, the one shown in Figure 9b, the refined grains have an appearance of a somewhat randomized texture. However, within one onion ring circle a high fraction of <110> crystallographic orientation was observed (Figure 9c). Grains located between two onion rings had more random orientations. The crystallographic orientation alternating between the strong <110> and the random crystallographic orientation appears to be another aspect of the onion ring structure. These results are qualitatively consistent with the findings of Fonda and Bingert31 who reported periodic texture variations in banded regions in friction stir aluminum welds and related that periodicity to the variable strain experienced by the metal deposited behind the tool as the tool rotates and traverses. Color Euler maps of (a) as-cast A206; (b) FSP nugget; (c) FSP nugget within the onion ring. Different colors in the IPFs represent different crystallographic axes parallel to the FSP traverse direction. Friction stir processing of an A206 aluminum alloy cast plate has been shown to be capable of producing significant local changes to the microstructure of the casting. The most dramatic effect is a refinement of the grain size from about 400 microns as cast to 10 microns and finer within the FSP nugget. The size of porosity features and intermetallic particles was also seen to be greatly reduced. A significant increase in the ratio of high-angle grain boundaries to low-angle boundaries is another result of FSP of the cast alloy. The grain structure after FSP develops by a dynamic recrystallization process. As observed by previous investigators, FSP generates an onion skin-type structure visible in the transverse nugget cross section. Consistent with previous work, the grain structure within the onion skin structure was found to contain aspects of preferred texture as part of its structural makeup. Our intention has been to illustrate the value of FSP in modifying the structure and properties of cast parts. We recognize that this work employed a cast flat workpiece, while most shape cast parts have more complicated geometries, which will certainly present a challenge for applying FSP. It is envisioned that FSP would only be employed in accessible locations on a cast part to resolve some specific issue, such as to heal porosity. If porosity can be controlled to form only near flat or convex surfaces, then FSP conceptually can be used to heal it. Clearly, there will be challenges in designing the proper fixtures for the workpiece and in controlling the tool path and load. The exit hole will also need to be addressed. Strategies to deal with exit holes could include designing the path of the tool to leave the hole at a non-critical portion of the part or employing a welding operation as a post-FSP process to seal the hole. Obviously, each cast geometry would present its own challenges; FSP is a novel enabling technology to locally engineer the microstructure. 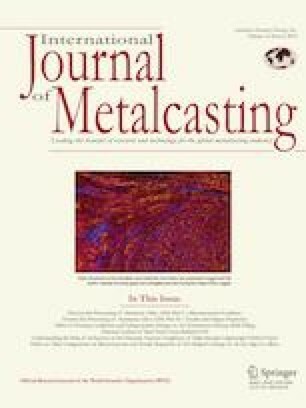 The authors gratefully acknowledge the member companies of the Advanced Casting Research Center (ACRC) for their support of this work, and for their continued support of research focused on the science and technology of metal casting at Worcester Polytechnic Institute.